Every single one of the 100 most frequently used words in the English language is of Anglo-Saxon origin. 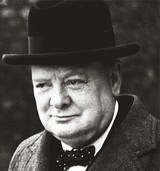 So are all the following words from Prime Minister Winston Churchill´s 4 June 1940 address to the House of Commons ― save one. Care to hazard a guess which is the sole exception? “We shall fight on the beaches; we shall fight on the landing grounds; we shall fight in the fields and the streets; we shall fight in the hills; we shall never surrender.” To unearth the Norman invader, see English Comes From Holland and Germany. Are Sinking SATs an Education Omen?